Ghost Town #1 is a new release from the Danger Zone imprint of Action Lab Comics. The Danger Zone imprint publishes comics for mature readers that contain scenes of violence or matters of a graphic nature. Ghost Town is written by Dave Dwonch with art and colors by Justin Greenwood and Brian Dyck respectively. Ghost Town #1 has a common theme that is especially relevant today when technological advances are occurring at a rapid pace – what if the wrong people got their hands on a piece of world-altering technology? The majority of the issue explores this theme as things do not go according to plan early in the story. A group known as the American Reclamation Front begins terrorizing the American people by planting bombs in US cities across the country. Will the US government meet their demands or will the citizens suffer for the government’s purported transgressions? The dialogue is sharp and the story is well paced, blending elements of sci-fi, espionage and political thriller. There are a lot of story points in this issue and you certainly get your money’s worth. The creative team establishes several threads in Ghost Town #1 that I am looking forward to exploring in future issues including the big reveal on the last page. 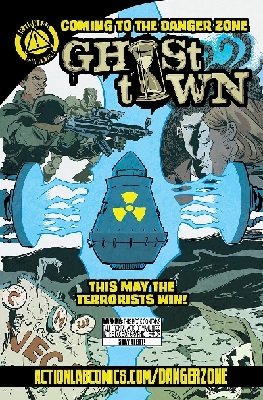 Dwonch and Company have provided comic fans with a unique spin on the time travel genre in Ghost Town #1. If this is any indication of the quality of books we will see being published under the Danger Zone imprint, I am excited to see what else Action Labs has in store for us. This entry was posted in Action Lab and tagged Action Lab, Brian Dyck, danger zone, Dave Dwonch, ghost town, Justin Greenwood. Bookmark the permalink.